Quickly charge or power your laptop with the FlexLink USB-C 100W Cable. 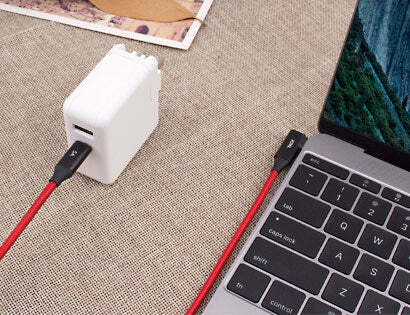 Supporting an incredible 100-watts of power pass through, more than enough for high powered laptops like the 15” MacBook Pro, this slim and flexible 2-meter cable makes it easy to stay connected and charged. 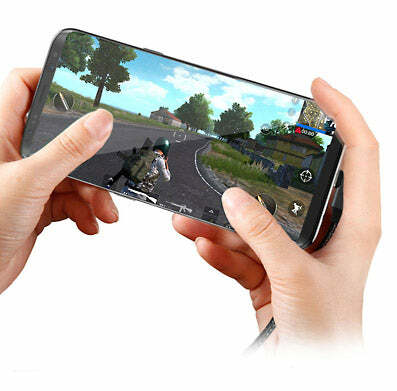 The 90-degree connector at one end makes cable management a breeze, and the advanced shielding and USB 2.0 data transfer speeds ensure reliable data syncing. Durable stress relief points, aluminum connectors and a braided jacket ensure the FlexLink USB-C cable is built to last. Providing up to an incredible 100W/5A power pass-through, the FlexLink USB-C cable enables you to charge a high powered laptop at full speed. The 90-degree connector makes cable management easy, allowing you to stay charged while keeping the cable out of the way when using you laptop or mobile device for gaming. 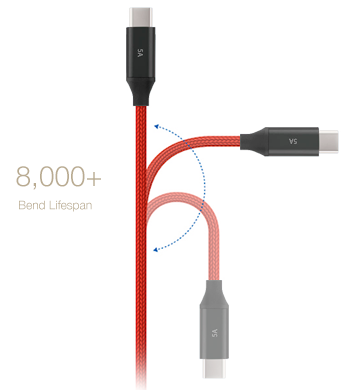 The FlexLink USB-C cable features flexible strain reliefs to prevent fraying around the connectors, as well as a durable braided jacket to ensure a lifetime of use. The 2-meter length of the FlexLink cable means you no longer have to sit on the floor next to an outlet to use your device while you charge.